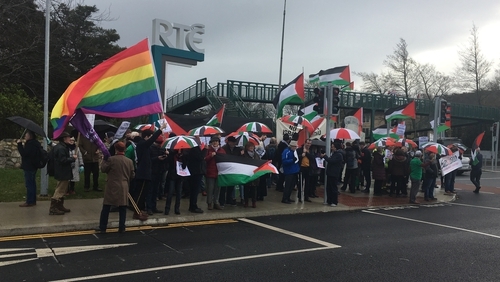 Dozens of protesters are demonstrating at the gates of RTÉ this afternoon, calling for it to boycott this year's Eurovision Song Contest in Israel. The protest is being led by the Ireland-Palestine Solidarity Campaign. Campaigners will hand in an additional 5,500 signatures to a petition which calls for RTÉ to boycott the event. They are also calling for Ireland’s entry Sarah McTernan to refuse to take part in the contest. Actors and musicians including Donal Lunny and Rynagh O'Grady joined the protest, with Mr Lunny saying Israel was using the song contest as a political tool and they should not be allowed to do so. Speaking ahead of the protest, spokesperson for the campaign Zoe Lawlor said that while they congratulate Ms McTernan on her selection for the contest, they are appealing for her not to take part. The head of the Irish Eurovision Delegation, RTÉ's Michael Kealy, said RTÉ respects anyone's right to protest, but said RTÉ is a public service broadcaster and doesn't take a political stance. He said all of RTÉ's colleagues throughout the European Broadcasting Union, such as the BBC and French TV, are participating in Eurovision this year. He said the contest is about music and is not political.